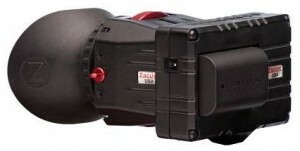 Cineroid, Redrock, and Zacuto have all announced EVF (electronic view finder) solutions in the last year to change the very poor unbalanced ergonomics of DSLR video cameras. (Well RedRock doesn't really exist -yet..). The pitch is that you spend a good amount of money on a 3" LCD that can be used as a remote monitor, and then they add on a 'Loupe' to magnify the image and give you a clear image even in the bright sun. Sounds great, i'm totally sold on the idea, but wait. Here's a few new EVF ideas to consider that might make you think a bit differently. DSLR's already have a 3" LCD, so if you're looking to add a remote monitor, why not go a bit bigger? 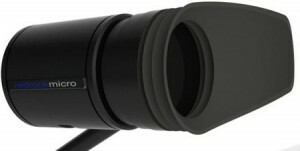 Perhaps SmallHD's newly annouced 4" EVF remote monitor + LCD Loupe. This makes a bit more sense besides being 'of the cheapest' solutions. 4" LCD gives you a bit more usability as a Remote LCD Monitor, and still a very large clear picture when using the Loupe attachment. Why is everyone else stuck on 3"? Ok so the SmallHD looks like a winner in my book. One of the best displays with highly customizable features makes it a good bang for the buck. Now check out what Cinevate's been up to. The Cyclops is already a ViewFinder Loupe for 3" LCD's, but with the right molds, it can be customized to suit any monitor including Sony's new 5" LCD HDMI monitor. BTW if you're wondering, we did test the Sony LCD on our cameras. It works great and decently priced (for a 5"). So if a 3" LCD is just too small to make sense as a remote monitor, or even if a 4" is just a bit undersized, hopefully Cinevate will be able to create adapters for their Cyclops element to mount to a variety of popular LCD's. I wouldn't mind having a Cyclops on my SmallHD DP6 5" LCD. Posted in dslr follow focus, Equipment Reviews, Lens Talk, Videography Gadgets. 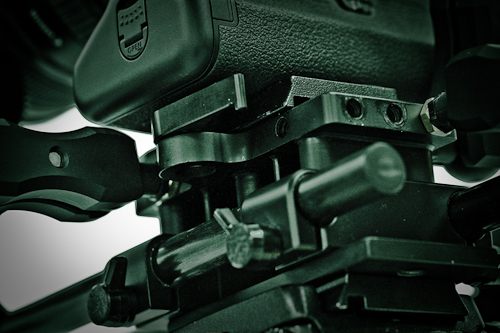 Tags: cineroid, cinevate, cyclops, DP4, DP6, redrock micro, smallHD, sony 5" LCD, zacuto evf on April 27, 2011 by Emm. Second on the list. Well well well..here's a Clone after my own design, another SpiderTrax dolly. This one doesn't look very good and shipping makes it more expensive than the Konova clone. Konova's design seems to be more polished, and this one looks exactly like another home made overpriced knock-off. 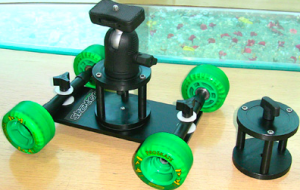 Yeah get yourself a Konova dolly if you really need one. Third up, this one goes out to the boys in Blue. 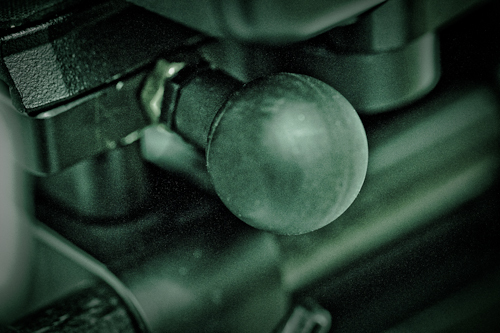 It's been said that the Blue accented Follow Focus was based on a Huco gearbox, and so is this one. 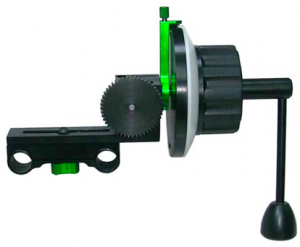 This DSLR Follow Focus clone for standard Rail mounts come with flex gear, speed crank, whip, yadda yadda yadda. You can get more info via the links. At this price, you might still be better off going with ikan's latest Follow Focus system. Posted in DSLR Slider, dslr stabilizer, Equipment Reviews, ikan, Lens Talk, Video Dolly, Videography Gadgets. Tags: carbon dolly, cinevate, follow focus, redrock, rotating dolly, SpiderTrax on February 23, 2011 by Emm. Here's a cool little Ad shot for Cinevate's new DSLR rig. 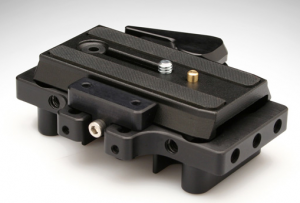 Most DSLR rigs are built around a foundation of rails, but Cinevate's new 'Simplis' takes a different approach to where the rig starts from a custom Quick Release Base plate. 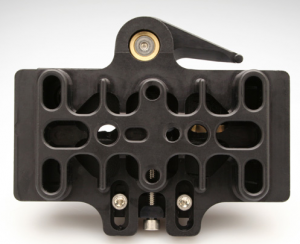 The Quick Release base plate is Manfrotto compatible and has several 1/4 x 20 threaded holes to mount anything from handles, to shoulder stock, to monitor arms, and more. The text below is taken from their Vimeo page. 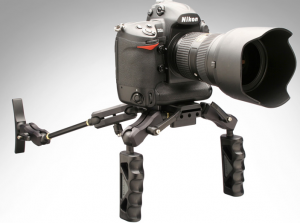 Introducing the Proteus Simplis DSLR Rig. This rig embodies simplicity and scaleability. 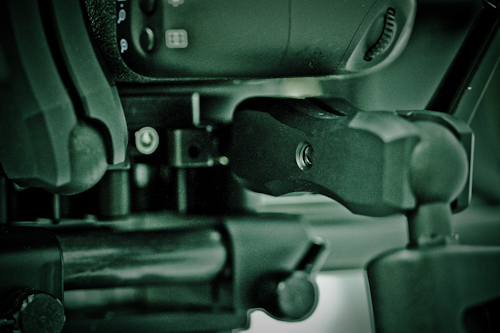 At it's core it is the foundation for countless, customized DSLR rig configurations. 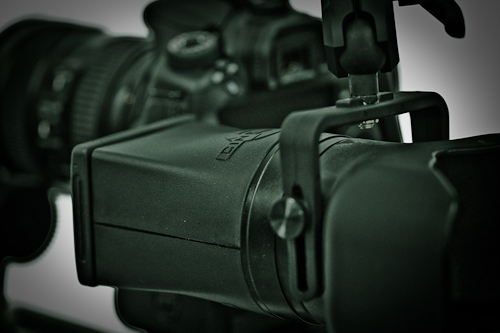 It is the DSLR rig that covers the complete spectrum of shooting styles and skill levels. Posted in dslr stabilizer, Videography Gadgets. 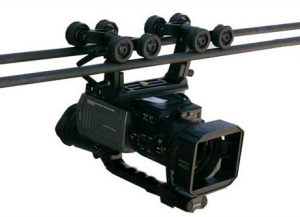 Tags: cinevate, dslr rig, Simplis on February 17, 2011 by Emm. Checking out some new ideas for upcoming car related footage, here's a fun clip to share. This BTS video is using Cinevate stuff for a NOS energy drink clip. Not sure how many of you caught this video since it's been up for a few months now, but if you're into cars and cameras it's one to watch. The camera guys on this shoot have got some true guts to be that close to a fast moving car. I personally would have just placed a tripod, but that might defeat much of the excitement too..
Posted in cinevate, dslr stabilizer, Videography Gadgets. Tags: cinevate, nos energy drink on January 22, 2011 by Emm. 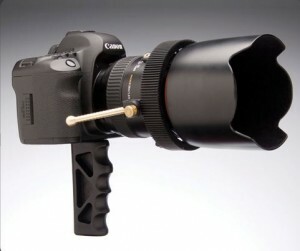 Cinevate has been one of those companies constantly surprising everyone with new innovation around DSLR accessories. Their line of Linear Rails a.k.a. 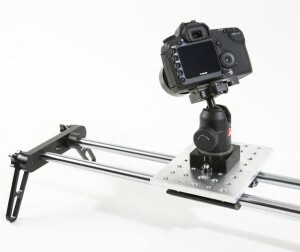 'Camera Sliders', 'Pegasus Carbon table Dolly', and 'Cyclops View Finder', are just a few of those examples. Building a DSLR rig traditionally starts with a foundation of rods, but the guys over at Cinevate.com are working on something a bit different. Opening up to the more budget conscious audience, a new concept is based around a specially designed "base plate(slash)quick release(slash)cheese plate". 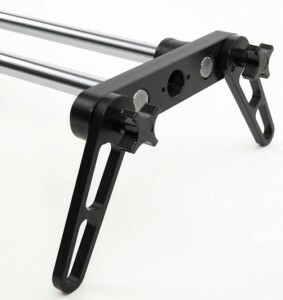 Stabilizer handles, articulating arms, positionable clamps, and more will directly attach to this 'basequickcheese' plate using threaded mounts acting as a foundation for a custom fit rig. Not sure what it's all going to be labeled as, but for further expansion the base plate combines with rails to support items like a follow focus system or matte box. 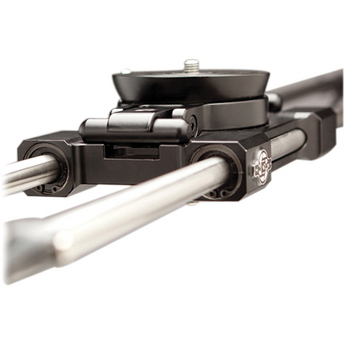 Threaded rotating ball clamps and multi-length clamp rods can be mixed and matched for different purposes. Lots of new stuff in the pipeline and more will be posted about these things soon. Not sure if any of this is available, or if these ideas will make it out to the storefront, but you might be able to grab some info over at Cinevate.com. Posted in dslr stabilizer, Equipment Reviews, Lens Talk, Videography Gadgets. Tags: base plate, cheese plate, cinevate, clamps, cyclops, handles, rods on December 21, 2010 by Emm. Cinevate is really on the ball with DSLR innovation. It seems like they are always one step ahead of everyone else when it comes to different rigs, support systems, and accessories. Just caught this video that first talks about their inexpensive Cinevate DSLR Camera Grip, and then towards the middle provides a sneak peek into their new Cinevate 'Cyclops' viewfinder system. 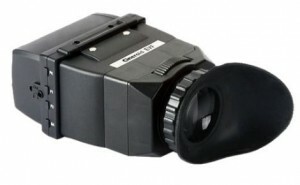 The Cyclops two-eyed viewfinder is the most different thing i've seen in a while as far as DSLR products go. I'm not really sure what to say about it just yet as there's not much information posted on their website. There is a bit more information via Cinema5D Jared Abrams' quick take video on YouTube. Posted in DSLR Audio, Equipment Reviews, Lens Talk, Photography Gadgets, Videography Gadgets. Tags: cinevate, cinevate cyclops, cyclops view finder, dslr camera grip on September 6, 2010 by Emm.